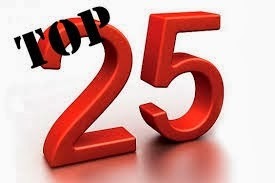 Below is a list of The Top 25 Most Popular Mystagogy Posts of 2014. These were posts from 2014 only, and do not reflect posts of previous years nor from my other websites. Personally I find it to be an interesting list filled with surprises, and it shows what drove most people to my website and reflects their interests. Like previous years, the first three received more than double the page views of all the rest. Thank you all for visiting over the past year and for your support, and I hope to provide even better more compelling material for the coming new year. Please continue to support this ministry to widen our audience with even more compelling posts, and if you haven't given financially to this ministry in 2014 please do so today by clicking on SUPPORT THIS MINISTRY. I thank you in advance and a blessed and joyous New Year to all! 6. "Religious People Are Dangerous ... God Protect Us From Them"
16. Did Only One Thief Insult Christ on the Cross? 21. Which Sea of Palestine Are You?